I’m hosting my book club luncheon meeting in two days. I fear it will not go well. I’m not a natural at entertaining and hosting and such. Very unnatural, I would say. Ha. And hosting this bunch of ladies all of whom seem to entertain large groups of guests as easily as drawing breath is, well, intimidating. I laughed the other day when Hubby asked me what I was planning to serve. I told him, and he said after a short pause, “I think you might want to consider something that has fewer moving parts, Suz.” “Oh, good call! ” I gasped. “What was I thinking, anyway?” Juggling too many things in the kitchen, and getting the timing right, or wrong, more likely, is the hardest part for me. Partly because once guests arrive I start chatting and then forget what was being cooked, and where, and what needs to be basted or turned or whatever. And partly because I get all “flappy,” as we say in my family, when company comes. I keep thinking of that scene in Bridget Jones’s Diary where she has her friends over for dinner and it is such a spectacular disaster. Blue soup, congealed main course that doesn’t get served, and a gooey dessert that tastes “like marmalade,” as one character describes it. And unlike Bridget, my Mr. Darcy will not be here to remind me to do this or that, or to rescue the whole meal if required. He’ll be off golfing. I can’t explain why hosting this “event” freaks me out. These women don’t intimidate me normally. I’ve known them all for years, worked with several of them, even travelled with a couple of them. They’re my friends. But they are all accomplished hostesses. And I am not. And before you say it, or think it, I know they don’t expect haute cuisine. I know they won’t think badly of me if I mess everything up. I know all that. But knowing it doesn’t help in the least. I’m still stressing. Now, since my upcoming event is a book club meeting, let’s talk books for a bit, shall we? The book we will be discussing later this week is Unearthed by Alexandra Risen. It’s a memoir of Risen’s life and of her gardening adventures. Risen and her husband bought a home that backs onto one of the many ravines which crisscross the city of Toronto and form a huge wild urban forest. 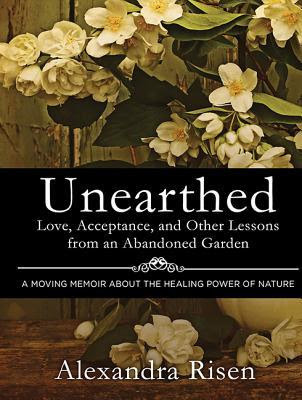 Risen’s memoir describes her and her husband’s efforts to rehabilitate their large, very neglected garden. At the same time Risen unearths her own past, and triggered by the death of one parent and the decline of the other, explores her relationship with her parents. It’s a really interesting subject for a memoir, it had positive reviews, and I wanted to like the book, but I didn’t. I found it over-written stylistically, and a bit contrived, to be honest. So when it came due at the library I just returned the book without finishing it. Maybe if I’d persisted, I’d have come to like the book. We’ll never know. And lest you think I never finish my books for book club (I’ve been guilty of that a few times this year), I should tell you about the book we read earlier this month for my other book club, and which I did finish. 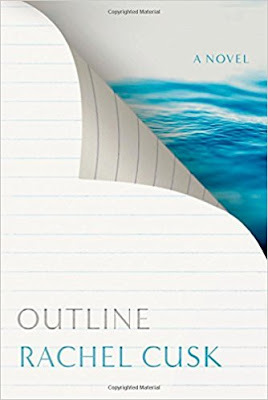 Outline by Rachel Cusk reads like a memoir, but is fiction. It is the story of a writing teacher who spends a summer in Athens teaching a writing course, and encouraging her students to observe the world around them, and to tell their own stories. The book’s plot is not a linear one. Instead, it meanders through the narrator’s life in Athens, depicted by a series of conversations the narrator has with a Greek man she met on her flight to Greece, with a fellow teacher from Ireland, with her students, and with friends. And while the friends and acquaintances are, on the surface, telling the main character their stories, we are also learning about the narrator herself. Cusk’s writing is exquisite, and I found the minutiae of the lives of the various characters fascinating. At our book club meeting, at a favourite Thai restaurant, we had a wonderful conversation about the book, and about the power of observation, and story telling. We none of us thought Outline was a perfect book, but even those of us who didn’t much like the book at all found redeeming features in Cusk’s work. You can read a review of Cusk’s book here. In other book news, I’ve just finished listening to Elizabeth George’s newest Inspector Lynley book, The Punishment She Deserves. At just over 700 pages, this book is a behemoth, and since I’ve been struggling lately with upper back and neck issues, and trying to eschew reading heavy, hard-copy books, I decided to listen to it on my i-pod instead. Oh, my… twenty-two hours of rapt attention later, I finished it, eminently satisfied. Sigh. The Punishment She Deserves is classic Elizabeth George. Like Peter May, and Reginald Hill, and P.D. James, George at her best puts paid to the idea that mystery writing cannot be brilliant and well written. In fact, I have never done so much housework, pedalled my exercise bike, or walked the trails as much as I have lately, just so I could keep listening. I was disappointed when Hubby volunteered to join me on my walk one day. I mean, if he came I’d have to talk to him and not be able to listen to my book. And most exciting as far as book news goes, I used my Christmas Indigo gift card yesterday to buy Paula Mclain’s newest novel Love and Ruin. 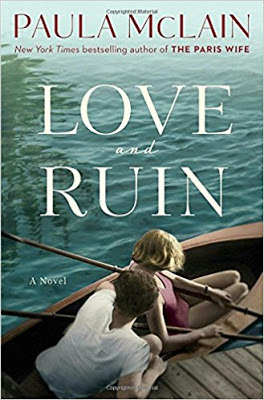 Love and Ruin is a fictionalized account of Ernest Hemingway’s stormy relationship with his third wife Martha Gellhorn. I’ve long been fascinated by Hemingway. And by Martha Gellhorn, a famous journalist and war correspondent, and the only woman to leave Hemingway before he could leave her. Ha. You can read a review of Love and Ruin here. I adored Mclain’s The Paris Wife. Similarly her novel Circling the Sun about the life of Beryl Markham. I wrote a post a while ago about both of these books, and about my tendency to “read round the subject.” You can check it out here. I am so looking forward to Mclain’s newest book. And in order to properly “read round the subject,” I’ve just ordered Gellhorne’s Travels with Myself and Another, her memoir of some of her travels with Hemingway, the “another” of the title. I obviously intend to spend quite some time down this particular reading rabbit hole. Now, back to my cookbooks, and the impeding “event.” Maybe I’ll serve an Asian kale salad that I’ve made numerous times before, with barbequed and thinly sliced pork tenderloin, and Hubby’s fresh asparagus. Or maybe not. We have fresh rhubarb in our garden. Rhubarb crisp is a simple enough dessert. I need to make a shopping list. I need to get organized. There will be no blue soup and marmalade dessert à la Bridget Jones. Hopefully. In fact, I think I’d better prepare everything for the luncheon the day before. That way I don’t have to worry about what is burning where, and which dish needs to be braised, basted, turned, or whatever. I can simply swan around topping up glasses and making sparkling conversation. How about you folks? Any entertaining disasters you might like to share? Maybe you prepared a lovely dinner for guests, including your principal, one year early in your marriage, and when you opened the fridge to retrieve the salad, it slid out, paused in mid-air (no lie) and then flipped upside down. Salad on the floor, bowl on top, me flapping hands, and Hubby saying quietly, “We’ll just scoop this all back in the bowl and no one will know.” He’s so calm in the face of disaster. Um…. I just clicked “publish” on a long comment, but it didn’t, did it?…. oh well, waving from Munich, glad to know you liked George’s latest S much as I did. Sorry about that, Frances. Hope that Blogger is not malfunctioning. I've not been receiving my comment notifications via e-mail since the GDPR changes. There is a long list of complaints to Blogger about that on the Help section, so it's not just me. Entertaining is really about making your guests feel welcome, making it apparent that you are glad they are in your home. It's not about making everything yourself. Make one thing, something you can do well, and then purchase all the other elements. Set a pretty table, add some fresh flowers, and then relax. When you are relaxed, your guests will follow suit and no one will care if the meal was prepared by you, or came from the local deli. I actually do like to cook, it's just the many moving parts that are involved in having more than three or four guests for a sit down meal. Relaxing is not my strong suit… wish I knew how to achieve that. Similar issues with entertaining/book group. Fortunately my book group does not eat, all I have to provide is drinks & nibbles. But cooking for guests I definitely use your strategy – the more intimidating they are the less I want to do once they have arrived. Four hour Jamie Oliver casserole in the winter, Chicken Caesar salad all prepped in the summer; if you get either of those in my house, you'll know you have me thoroughly intimidated! Cheat away; it works, no-one cares and you can have a good evening. I love to have girlfriends over when it's just nibbles and wine, or potluck where I make the main course and people look after all those other annoying courses. But a sit down meal for 8 women… ackkk. I can understand your trepidation at providing a good lunch for your friends . Years ago we used to do the dinner party thing but now we usually meet friends at a restaurant, so I’m out of practice these days . One male friend used to go all out to impress with ingredients specially sourced & preparation taking a couple of days . He would end up very stressed & feeling unappreciated – drove his wife crazy ! My sister buys everything ready made & sometimes even forgets to dish out cutlery . People love her get togethers as they are so relaxed & she has plenty of time for her guests . I’m somewhere in between , I think . Travels with myself and another is one of my favourite books & it sits on my bookshelf . What a fascinating woman . Hope you enjoy it & that the lunch goes well too . We are out of practice too. We used to have dinner parties quite regularly…. but what with cleaning the house, then making an appetiser, a first course, main course, dessert, not to mention all the timing stuff… I just wasn't having fun. And then what's the point? I am looking forward to reading Gellhorn's book. Glad to have someone's opinion I trust give it a vote of confidence. Lord, yes. My best was when I argued with one of the guests and got so drunk I simply vanished upstairs. I remember nothing except having made syllabub. I would say that I was having a difficult time…much more relaxed about cooking now and make food I know how to cook, make sure I have plenty and let people get on with it. And much prefer to do lunch rather than dinner. Book-wise, we have just returned from a week in France and I bought a Jack Reacher novel at the airport, which is perfect for the nervous flier. I only wish I had bought two. Something about the intensely wordy nonsense is very calming. Ever since I got above myself and took Seneca to read on holiday to Greece (what a stupid thing to do…) I have erred on the side of blockbuster for travel. Shallow certainly, but I think I might know how to take out five assailants at once now. Watch it. Oh…I'm sending your comment to my friend J who missed a family Christmas dinner at her own house for that same reason. Too tired from cooking and too stressed to notice she was chucking back the wine. A true Bridget Jones moment. A very good friend of mine (who is an excellent cook) once produced a Christmas dinner having drunk an entire bottle of sherry throughout the prep. When it came to actually serving it, she put it on the table and said: here you go, can't be bothered…and staggered away. We used to get together on Christmas Eve and have a celebratory hand-wringing session to remind ourselves of earlier anxieties when we both used to stand in front of the festive cooker and drive ourselves insane. My husband loves to entertain and the more the merrier in his mind. He is from a large family so his. norm too. I have learned and we have a good system, rhythm when getting ready to entertain. Fresh flowers, pretty plates, napkins, water and other beverages. We have done book club food based on the theme of the book, place, season. That gets interesting. Yes, we have had our disasters and I agree with Lach as Ina Garten is a big believer in buying food for less stress. I agree about making one's guests feel welcome and as an introvert that is where I fall short as I want quiet and my book! I think the rhubarb crisp sounds perfect! Raining here today after record high heat wave and hoping our rhubarb is still good. Can't have fresh flowers unless I want to be sneezing into everyone's plates. Ha. Tried that one before. Ended up with the vase out on the deck where we could see it through the window. Oh boy, I feel for you! When I entertained with friends, notice past tense, I'd usually be exhausted when the event happened! Now a days, I cook when my kids visit. I even find that stressful with all our dietary needs….vegetarian, type 1 diabetic, allergies. I thought when I retired I would step up my game in the kitchen (which I have with my hubby)and entertain much more. Now that I have time, why wouldn't I? But I discovered at 63 that's not my nature. The stress and workload I put on myself is too much and I'm not a lazy person! We find it easier to meet friends at restaurants. I really do admire my friends who make it look easy. I agree with Lach….make one thing you do well and purchase the other elements. I think I'll practice those words for an upcoming event. I know, eh? I never really enjoyed hosting dinner parties. So much work, so exhausted from cooking and cleaning before we even sit down to eat. My fav things now are the potluck supper parties we have with the hockey gang, ten or fifteen couples, tons of food, no stress. And lots of laughs. Hmmnn. One book club where you don't finish the prescribed books and put yourself through a real life Bridget scene. The other book club where you finish the books and find yourself discussing them unstressed in a nice Thai restaurant. Those ladies in club no. 1 must be very special! And they love you "just the way you are!" to quote a line from the film. So don't fret. My cooking disaster? I was a ship's cook. I watched helplessly as an unexpected big wave on an otherwise calm sea threw my large pot of chicken curry on to the floor and under the kitchen units. I had less than an hour before lunch HAD to be served. I got down on my knees and scooped up what I could back into the pot. I washed the floor to remove all evidence. I dashed down to stores, grabbed some frozen chickens and ran them under the hot water tap until I could chop them up. I boiled them up in the scooped up sauce. I served lunch on time with the biggest smile I could muster. Nobody died. Love that story Mary. I hope everyone is satisfied with me being "just the way I am." ha. Should add what one of my best friends always says.. I dress to kill and cook the same. Ha. Love it, I just need to work on the dress bit now! LOL on hosting Susan. I know what you mean. Me and my wife are digital nomads. We house sit all over the world and live with family back home in the US. Not hosting naturals at all when we have friends over during world travels, although when fam visits in NJ we are getting a bit better. Enjoy! House sitting around the world sounds wonderful. Ever done that in New Zealand? It's just about one of our favourite places for travel. Here's hoping for a smooth gathering for you and your book club! Great story, Charlene. A fire… I haven't had that disaster… yet. Phew! I thought I was the only member of this book club that worried about my hosting ability! Not sure why you should worry.. remember all those wonderful meetings when we had high tea and read British books? That was fun. Oh dear. That would be debut. I am just listening to Love and Ruin. I am enjoying it as much as I did all Paula Mclain's previous books. It is such a treat when she writes a new story. I am also preparing to host our next book club in July. I think my selection will be The Honey Farm. I enjoy contemporary Canadian fiction written by women, and am always drawn to debeut novels. Can you imagine the fun I can have with the menu for that meeting? So glad you're liking Love and Ruin. I don't know anyone else who has read it. I hope that the other book club members read your blog :-). I love to entertain (from my early university days-one of greatest compliments was that-the first time- my colegues were very surprised. They have thought that I look like someone who could only do her nails. So,perception is everything! ). The first cake for them was not looking perfect to my (than) standards,so I served it as "catastrophe cake"
Think of it as your very own potluck lunch (although more a one woman show! ),make a drink-salad-side dishes- dessert-bar and enjoy! Funnily enough several members of my book club did read the post… and pretested that they are not natural hosts either. Sure looked that way to me, though. Hi Sue, I hope that your Book Club Luncheon was sress free and I’m sure your food was delicious! I think it’s best to keep things simple but fresh and tasty. Do as much prep beforehand as possible so you’re able to relax with friends and enjoy yourself:) Oh and don’t feel guilty for buying something eg a ready made dessert. Not so lately! We tend to meet friends out in restaurants and often eat out for family birthdays etc Interestingly it’s not just me, most of my friends are the same. To be honest, as you mentioned I think “wine and nibbles” get togethers are the best, often impromptu and especially in the garden in the Summer. Outline definitely sounds like a book to add to my list. We meet friend out now too more often than not. Stu and I love to cook, to decide what we'll have for dinner and come up with new dishes etc. But when that is combined with having to clean the house, make apps, and dessert, and a starter course… the fun is all gone for me. Yes, I join you in guest angst and I'm definitely out of practice. I have to bring a dessert to an event this weekend and I'm stressing over that! Can't imagine if they were all in the house. Plus my cleaning phobia kicks in. Ugh. My DS and DIL live in a neighborhood off one of the Toronto ravines and it's glorious. Sorry to hear the book wasn't great. It sounds like it has great potential. But I do always love your book suggestions, so lots to check out. I went to see Book Club the movie with the ladies from one of my book clubs. We had a few laughs, but I didn't really like the movie. I thought it kind of stereotyped older women even as it tried to show otherwise. Candice Bergen was the only bright spot for me. The theater was also filled with middle-aged ladies, or older. I share your anxiety about hosting. For me it's the most stressful part of belonging to a book club. It always turns out better than I think it will, but I know when my turn comes up again I'll be pulling my hair out. BTW, I love when you write about books! It turned out better for me than I thought it would. Thank goodness! It's the relaxing part that I struggle with. Or I do relax and forget about the food. So reassuring to read about someone who struggles with entertaining. I wish some psychologist would explain it. The only reason I can think of is having grown up in a rural area where people just drove into the yard and sat down at the table (no phones), eating whatever happened to be in the cupboards. But my sister who had the same experiences belongs to a gourmet dinner club. So there goes that theory. I follow your blog because of the fashion content. Maybe there is a connection between being interested in clothes and not being good at food?? Sue, I just forwarded the link to your blog post (above) to my book club members. We're probably going to choose a couple of titles from this post for future months. Thank you SO MUCH for your candid thoughts about each of these books. BTW, we do NOT cook for each other, but each of us brings a takeout to the local Episcopal Church parish hall where we have access to wifi (and can argue with each other about "facts") and nuke/reheat our takeout meals. We are SO much less ambitious than you about our book club meeting food. But our meetings tend to last FOREVER! I think it's becoming as much a group therapy session for us as a gathering to discuss books and writing. 🙂 Not a bad thing, eh? Hi Sue, I am not a natural-born cook and yet find myself doing lots of entertaining. You just need to simplify to minimize the moving parts. Start with a plated salad or a cold soup. Then do a one-dish meal made in advance and then follow with a store bought dessert already put out on the serving dish prior to the guests' arrival. Melissa Clark of the NYTimes has a whole bunch of sheet pan meals that could work for you. It took me decades to figure out a system and believe me when I say if I can do it then so can you. That's what I did, Phoebe. Bought the nibbles, made the salad and dressing, dessert, and marinade for pork the day before, then meat on the barbeque before everyone arrived. No first course because we are trying t keep it light as it's lunch. Worked out fine as it happened. I read The Paris Wife recently and enjoyed it very much, so I will have to add Love and Ruin to my list of books to read. Hope you enjoy it. I've delayed reading it until I read Gellhorn's memoir. When we have guests, its nibbles (like smoked salmon, fruit, cheese & crackers), maybe an appetizer and one main course. If someone wants dessert, they better bring one! haha Also having a salad, soft rolls with butter etc are nice additions. My hubby knows how to entertain better than I do. He cooks the main course. We've decided to have our first dinner party in years in a few weeks. Hubby is going to make the main course for the guests for the first time. Even though he cooks as frequently as I do, and in certain seasons more than I do, I have always been the one to cook for guests. No more! So this time around, he's doing the main course, and I'll handle the dessert, app, and first course. I don't find those as nerve-wracking. We'll see how we get on when it's share-sies all the way! I'm a shocker at entertaining. But if I ever attempt it, I just go for champagne, a cheeseboard and wing everything else. Your recent reads look interesting. Looking forward to finding them for my Kindle.